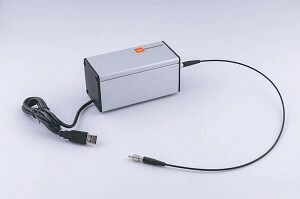 The CMA Spectrometer 012 is an easy to use USB spectrometer, which allows measuring emission spectra of light sources such as light bulbs, discharge tubes or sun, over a wavelength range of 360 - 940 nm. A fiber optics cable with SMA (male) connectors and a collimator are provided with the device. The Spectrometer connects to a computer via the USB port; it draws power from the host computer, eliminating the need for an external power supply. The Coach 7 software controls it. When the CMA Spectrometer is used in together with the CMA Light Source then absorption and luminosity (fluorescence, phosphorescence) spectra of various materials can be measured. The CMA Light Source is not included and has to be purchased separate art. code 012LS. More technical specifications about Spectrometer can be found in its User's Guide.